This week I’ve been dreaming about one day buying a tiny house, and using it as our cottage/fixer upper project. I think it would be great to learn more about how houses work, and how to fix them when they don’t. It’s not in the cards for a few more years, but I think about it often. Something like this, even if it seems like a ton of work. I haven’t been reading blogs much this week, as I have been reading “Man Walks Into A Room” by Nicole Krauss. I’m about halfway through, and have my suspicions on where the story may end up. I always hope I’m wrong, because there’s no fun in guessing the ending to things. At least, in my opinion. Had some issues with writing this week. Had some issues with a lot of things this week. Perhaps it was the lack of sunshine? As much as I love rain(and I really love rain), my body was probably telling me I needed some sun. I’m still open for design, organizing, or decluttering questions if you got’em. I’ve decided that’s a thing I’m going to do now, and not just because I can’t always be thinking about topics on my own. This brain was not tuned for writing, but I’m going to keep doing this because I feel it’s a good challenge for me. Brandon has a couple articles about the comics industry from a retailer’s perspective up at Comics Beat. I’m really proud of him, and am happy that site is getting his words to a new audience. I’ve not been keeping my promise. Yes, it was a silent promise, one I made to myself. But it still relates to this blog. I thought it may be neat to keep a weekly total or description of everything I’ve been decluttering, and post it here every week. That is absolutely harder than it sounds. Or perhaps it’s just really easy to slip my mind. I have five giant bags from the clothing swap last weekend sitting in my living room, ready to sort and determine where they’re going to be donated. However, it’s likely they won’t be going anywhere until at least next weekend. What have I gotten out of the house this week? Nothing. I have organized nothing. I have decluttered nothing. Unfortunately, I’m in the downswing of things where I feel terribly uninspired and cannot obtain the energy to bother. That extends to my writing as well, of course. I feel I’ve got nothing left and I’m only three months into this crazy thing. That’s where you come in. I need your help. If there is a topic you’d like to see on here or if you have a question for me, please leave a comment below. Tweet me at @DanicaHere if you’re on Twitter. Email me at danicaleblanc at gmail dot com if you have a longer question. I’ll post your question and answer your query or do research for your organization troubles in a future post. I’m going to keep banging my head against the brick wall known as writing, but if you can take a brick or two down, I can stop this terrible analogy. 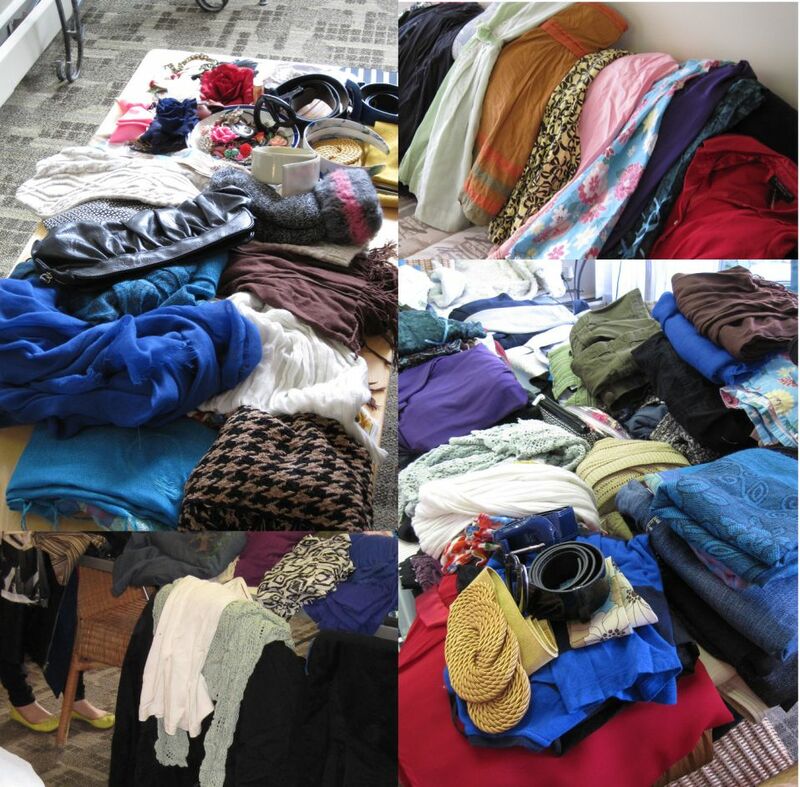 I held my second clothing swap(the first one was held last autumn) this weekend, and I think it went rather well. I had a great selection of women show up and even though a couple people couldn’t stay long, they still brought a fair amount to donate. I’m really proud of everyone who came by, and want to thank them for the items and great conversation. As you can see, we had a wide selection. I myself had filled two bags for donation and came away with one of all new-to-me items. My next step is to see where they fit in my wardrobe. What matches or coordinates; which items create the most solid outfits. It’s very possible I will still whittle down from the new stuff if something doesn’t work with the rest of my things. I will be holding another in the fall, for anyone who missed this one, but will not have a confirmed date until later in the year. If you’re interested in saving money and spending time with friends, I would suggest hosting a clothing swap in your home. It’s a wonderful way to save money and avoid clothing going to landfills. I’ll be going through the five(!) bags of clothing that are left, and will see what I can donate to the Bissell Centre, Goodwill, and the Onoway Thrift store. Last time around I only went to Goodwill, but I like to spread this kind of stuff around. There are so many wonderful charities in Edmonton alone. With further research(and by my next swap), I’m hoping to have even more knowledge about charitable options. 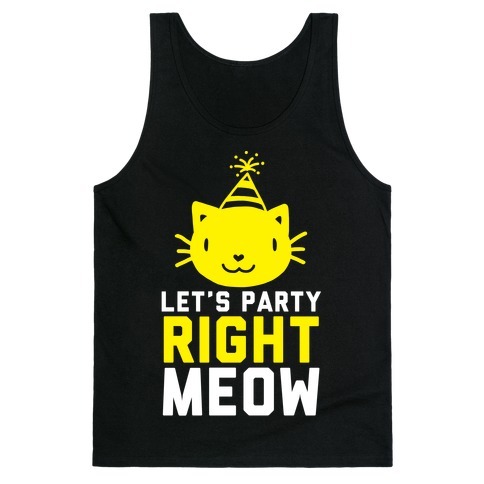 My temptation of the week is most of the cat-related shirts on this site. If I let myself, most of my tops would have some kind of cat on them. This may be going overboard, but look at how cute they are! 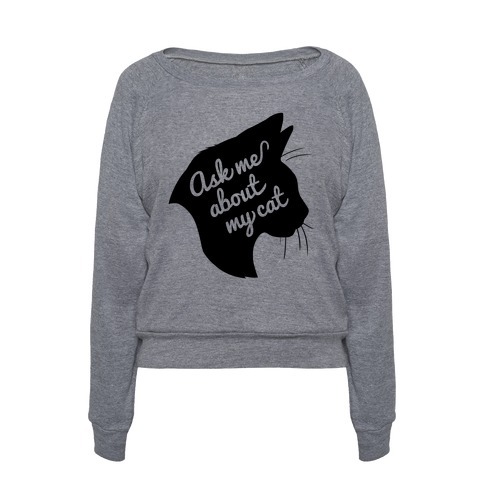 Pretty sure I could spend dangerous amounts of money on cat puns and other things that amuse me. I’ve been having some trouble focusing lately, and I know it’s something I should be working on, especially with the blog. It’s too easy to distract myself with Netflix (Brandon and I are watching season 6 of Psych), or Twitter. Those are my two big distractions and I hope I use them more efficiently in the future. My clothing swap is being held this Sunday, and I’ve continued to whittle down my wardrobe as the weeks pass. There are still things I’m unsure of, but I will keep my eye on those items as they may just not be weather appropriate right now and should probably go in my winter storage box. I will be glad to get the bags out of my closet, because they are taking up a lot of space. This article about weekend trip packing essentials made me think about how I pack when I go away, whether weekend or longer. There will be a few items in my wardrobe I will replace when I’m allowing myself to shop again(although I did find a couple things at Goodwill a short time back), but I found a couple new things for summer that I can use as basics and layer in the fall. As always, I will continue considering what items work best for me. Buying basics(for me, black, white, and jewel tones), but not forgetting to buy the occasional patterns. Nowadays, I find myself desiring more open space in the apartment. What is currently precious to us may be excess later this year, and I’m excited about possibly getting to rearrange the living room again. It’s a beautiful large space, but I may try splitting it into all its’ uses, just for fun. We’ll see. Anything moved can be moved back again if it doesn’t work in the new spot. 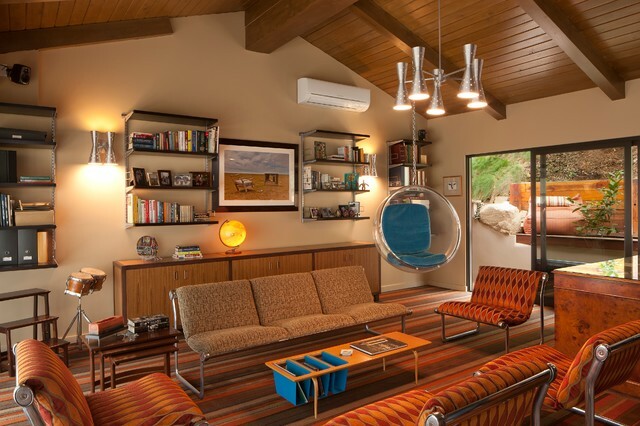 I found some pictures on the Houzz app that communicate what I think I want in a “dream living room”. 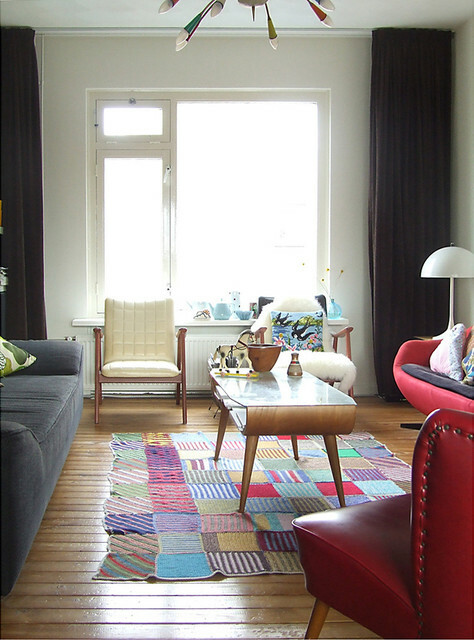 I like the openness of the rooms, but they’re not stark or plain. 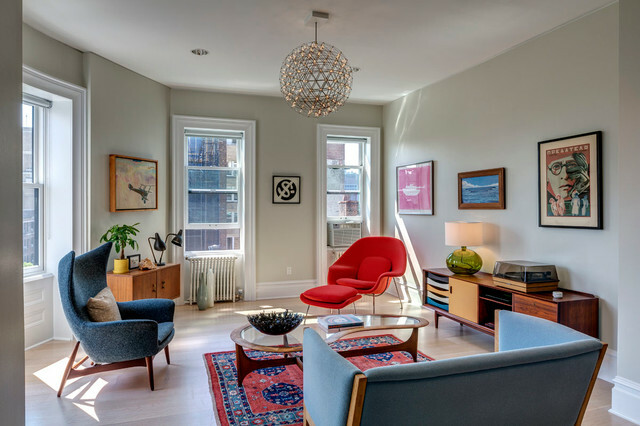 They have that ideal balance of open and cozy, and a comfortable layer of tchotchkes and personal items. Brandon and I had a few friends over this weekend, but I didn’t realize until the day after the event how much simpler it had been to prepare for the party. I’m not saying I didn’t stress a few times the week prior, but there were seemingly less things to do. Either that, or I’m getting better at being less stressed while hosting. I did some preliminary cleaning, but it didn’t seem as large a mountain as in previous times. Brandon had a few piles of books in the living room, which is usual for us. I wiped down the kitchen and we both pitched in with sweeping and putting things away. All in all, a great joint effort. I’m really proud of the work we did, and even the cleanup after the party didn’t take long. 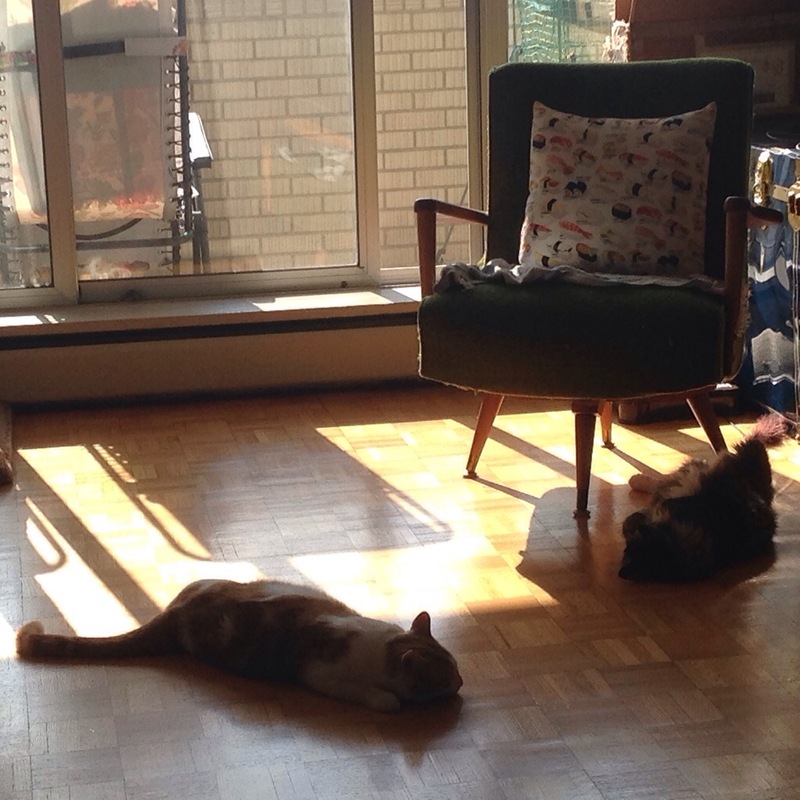 Looking at the living room now, I’ve currently got two happy cats laying in sunbeams, the floor is clear of books and fur(for now), and things are basically where they need to be.